A fire occurred in an Ethiopian Airlines Dreamliner, parked at a remote parking stand. There were no passengers on board and the plane was not due to fly for several more hours. Pictures showed the aircraft on the runway, surrounded by fire engines and covered in flame-retardant foam; TV footage showed an area on the fuselage in front of the tail that appeared to be scorched. It is not known if the battery system was associated with the fire, and the batteries are not in that part of the plane. A statement released by Ethiopian Airlines said the jet had been “parked at the airport for more than eight hours” before the fire. The lithium batteries were the cause of the previous incidents that led to the grounding of the Dreamliner in January. Flights at Heathrow were suspended for an hour and a half. Heathrow said suspension is a standard procedure if fire crews are occupied with an incident. BA now has two Dreamliners and a BA spokesman said it was too early to say whether its two would now be grounded. On April 27, Ethiopian Airlines was the first carrier to resume flights with Dreamliners. The National Transportation Safety Board said they are sending an accredited representative to London-Heathrow to assist in the investigation. Thomson Airways says one of its Boeing 787 Dreamliner planes traveling from England to the U.S. had to turn back after experiencing a technical issue. Thomson said that flight 126 traveling from Manchester Airport to Sanford, Florida had returned to Manchester “as a precautionary measure.” It said all passengers had disembarked from the plane and engineers are inspecting the aircraft. Heathrow Airport closed both its runways to incoming and outgoing flights today after a fire broke out on an aircraft on the ground. The incident, which was reported just after 4.30pm, involved an Ethiopian Airlines Boeing Dreamliner at a remote parking stand. Nobody was on board at the time, and no injuries were reported. Pictures showed the aircraft on the runway, surrounded by fire engines and covered in flame-retardant foam. 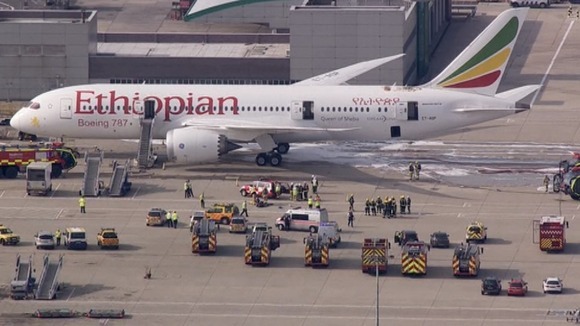 A Heathrow spokesman said: “We can confirm there has been an on-board internal fire involving an Ethiopian Airlines aircraft, and the airport’s emergency services are in attendance. The runways were reopened by just before 6pm, but Heathrow warned travellers to expect delays and check the status of their flights before traveling to the west London airport. Boeing shares fell 6.1 per cent on the New York Stock Exchange after news broke of the incident. The Dreamliner, also known as the Boeing 787, is claimed to be the world’s most efficient airliner but it has been plagued by problems since its launch. All Dreamliners around the globe were grounded for three months earlier this year after concerns that its lithium-ion batteries can overheat. There was a battery fire aboard a 787 in Boston in January, followed a week later by a Dreamliner in Japan having to make an emergency landing after cockpit indicators showed that a battery had overheated and failed. On April 27, Ethiopian Airlines became the first carrier to resume flights with Dreamliners. A United Airlines Dreamliner flight from Heathrow to Houston in the United States was cancelled earlier this week because of apparent trouble with an indicator device. Earlier, when the Dreamliners were grounded back in January, this graphic was produced showing where the lithium batteries are located in the plane. It appears that the burn damage on the Ethiopian plane is on the top of the plane in front of the tail. It seems from the Boeing illustration that the batteries are not located in that area, but near the middle of the plane. The diagram at this link (dating from January 2013) indicated that there are lithium batteries situated nearby, but it is probably wrong. LONDON (Reuters) – A Boeing 787 Dreamliner operated byEthiopian Airlines caught fire at Britain’s Heathrow airport on Friday in a fresh blow for the U.S. planemaker which earlier this year was forced to ground the new planes for three months because of overheating batteries. Boeing shares closed down 4.7 percent at $101.87. Earlier in the session they tumbled as much as 7 percent, wiping $5.4 billion off its market capitalization after television footage showed the Dreamliner surrounded by foam used by firefighters at Heathrow. Television footage showed an area on the fuselage in front of the tail that appeared to be scorched. It was not clear if the fire was related to the batteries, which were the cause of the previous incidents that led to the grounding of the Dreamliner in January. The Dreamliner’s two battery compartments are low down, according to public Boeing diagrams, while the visible damage to the Ethiopian plane appears to be higher up and further towards the rear, according to footage from the scene. “It’s very early. No one knows where the fire started at this point,” Rosenker told Reuters, adding it could be something as simple as a coffee pot left on in a galley. Boeing said it was aware of the fire and that had people on the ground working to understand the causes of it. The U.S. Federal Aviation Administration said it was aware of the fire and was in contact with Boeing. “This is terrible for the Dreamliner, any event involving fire and that airplane is going to be a PR disaster for Boeing,” Christine Negroni, an aviation writer and safety specialist based in New York, said in a telephone interview. “Because of the battery issue, the public is even more sensitive to events that happen to the Dreamliner. Even if they are normal, benign teething problems, that subtlety is going to be lost on the public,” she said. Another Boeing Dreamliner operated by Thomson Airways returned to the United Kingdom due to technical issues as a precaution, TUI Travel said. Boeing’s 787 Dreamliner was grounded by regulators in January after batteries overheated on two of the jets within two weeks, including a fire at Boston airport on a parked Japan Airlines plane. The new high-tech jet came under intense scrutiny and Boeing redesigned the battery system to add more layers of protection against fire. 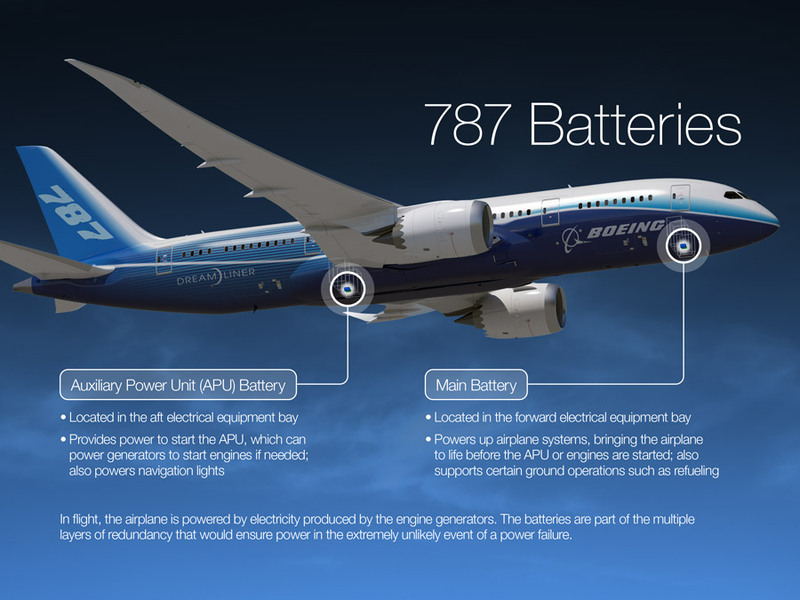 Boeing began installing reinforced lithium-ion battery systems on the 787 in April. The plan approved by the Federal Aviation Administration called for Boeing to encase the lithium-ion batteries in a steel box, install new battery chargers, and add a duct to vent gases directly outside the aircraft in the event of overheating. The 787 uses a powerful electrical system to drive air conditioning and hydraulic functions that are run from compressed air on traditional aircraft designs. That electrical system experienced fire during its development which also prompted changes in its electrical panels. It arrived at Heathrow from Addis Ababa in the early hours of Friday, according to the Flightradar monitoring web site. The plane was due to make the return journey later on Friday. Asked whether the incident could lead to the renewed grounding of Dreamliner jets, a spokesman for Britain’s Civil Aviation Authority said decisions on the airworthiness of particular models of plane were made by the European Aviation Safety Agency (EASA). United Continental and Polish airline LOT said they would continue to operate their 787s. pprune commentators initially seemed to think that the damaged area coincided with the “overhead flight attendant rest area” until later people said that Ethiopian plane did not have this feature. Another rumour circulating is that the fire originated in the rear galley where a water/coffee heater had been left on and had boiled dry and the electric trip had failed to protect it…….